Oral cancer kills one American every hour of hour of every day. Oral cancer strikes 3 times as many victims as cervical cancer and is as common as leukemia. When oral cancer is discovered in early stages, the survival rate is very high. Two-thirds of oral cancer cases are detected in late stages. When detected in late stages (which is normally the case), the survival rate is only 22%. Even if you don't use tobacco, you may still be at risk for oral cancer. Studies have linked oral cancer to exposure to the sexually transmitted Human Papilloma Virus (HPV-16) which means that everyone, men and women from the age of 14 years old and up, needs to be screened annually for oral cancer. 25-30% of oral cancer is linked to the Human Papilloma Virus. Oral cancer claims more lives than melanoma (skin cancer). Because of this risk to your health, our practice has recently invested in a state-of-the-art device called the VELscope® Oral Cancer Screening System. 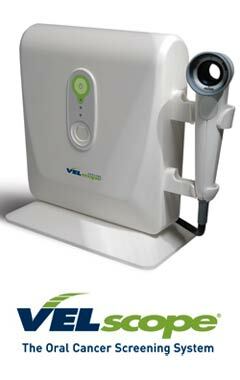 Along with our conventional oral screening examination, which includes looking inside your mouth for any lesion that might be visible to the naked eye and feeling your neck for any suspicious bumps, we can use the VELscope® to literally see beneath the surface to detect potentially dangerous growths we might have otherwise missed. In most cases, the VELscope® exam will reveal nothing of concern and take only a few minutes as a part of a regular hygiene check up. It involves no pain or inconvenience, and is completely safe. We think you will find the additional cost for this exam to be very reasonable. We believe you'll appreciate the peace-of-mind this screening can provide.